Laurie Kingery here, and for my blog this month I'd like to tell you about a magical place in my favorite part of Texas, the Hill Country. Enchanted Rock, an enormous dome of pink granite in the basin of the Llano Uplift, lies fifteen miles north of Fredericksburg at 16710 Ranch Road 965. 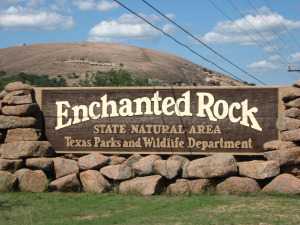 The Enchanted Rock State Natural Area lies on the border between Gillespie and Llano Counties, and covers 645 acres. It was designated a Recorded Texas Historic Landmark in 1936. Why is it magical? Legends of the Comanche, Apache and Tonkawa tribes in this part of Texas assigned spiritual powers to this rock, which they believed was a portal to other worlds. The Tonkawa tribe believed that ghost fires flickered at the top of the dome, and that the creaking and groaning noises they heard at night was caused by spirits. Another legend says the rock is haunted by an Indian princess who threw herself off the rock after witnessing the slaughter of her people. It's said that bad fortune and death will befall any who climb the rock with bad intent. There are supposedly footprints imprinted in the stone that belong to an Indian chief who sacrificed his daughter there, and was condemned to walk on Enchanted Rock into eternity. Geologists explain that the sounds are actually the contraction of the stones after their heating during the day. The rock has also been called "Crying Rock" and "Spirit Song Rock." The first European to visit it was probably Spanish explorer Alvar Nuñez Cabeza de Vaca in 1536. Indians hid from settlers on top of this rock, unseen by the settlers below. In 1841, from its summit, famous Texas Ranger Captain John C. Hayes fought a battle against Comanches who had cut him off from his company, and repulsed them, inflicting heavy losses against the Indians. I climbed to the top of the dome with my husband on our honeymoon in 2005. It is about 425 feet to the top by a steep, winding trail, so no scary climbing gear or danger was involved, but I doubt I could do it now! :) The view was amazing from atop the windy dome, as the picture demonstrates. I climbed that rock several years ago. thought I was going to die : ) going down was much easier. But it a beautiful rock standing out of nowhere. Worth the trip to go and see. That sounds really cool! I love local legends like that. I can just imagine how people felt about strange noises coming from a rock at night! Thanks for an interesting post. Thanks for commenting, Kathleen! You're always so faithful in doing that--I appreciate it! It really is an impressive sight--thanks for commenting! I'd love to hear the rocks "singing!" That's such an interesting thing how the rocks cry out. God's so awesome even the rocks sing His praises! Thanks for the post. Kam, what an absolutely wonderful thing to say--"even the rocks sing his praises." I hadn't thought about it that way, but you really blessed me with that--thanks! Btw, sorry I didn't comment sooner--I am at work from 6 pm to morning some nights, like last night. For some reason the computer won't let me comment on this blog or access some sites. Wow, I'm not sure I knew this even existed! Darn those history books that don't tell you much. It sounds like a cool place to visit and see the wonder of it. Thanks for telling us about it! Susan P, you're welcome! High school did its best to make history uninteresting--I'm glad we can find information now that makes it come alive. Thanks for commenting! Hi Laurie, this was one of our favorite spots to take out-of-town friends when we lived in Austin. The drive through the Hill Country never ceased to enchant and the roadrunners were plentiful. Thanks for the memories. I've been to Texas a few times, but always more to discover. I had not heard of this.